The Royal Australian Air Force established a Base Pool Camp at Aitkenvale during WW2. 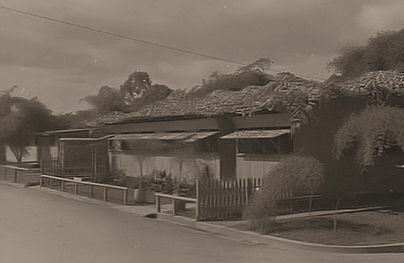 It was located near today's Burt Street, in Mundingburra. It comprised numerous pre-fabricated huts on concrete floor for accommodation. Other buildings included Kitchen and Mess facilities, Stores buildings, Ablution Blocks, Latrines, a Barracks Store, an Equipment Store, Administration Hut, Post Office, Hospital buildings, and Theatre Stage. No. 1 Reserve Personnel Pool RAAF (1RPP) was based at this Base Pool Camp. 1 RPP had been established on 12 November 1942 and they were initially based nearby at "The Weir" at Aitkenvale. During that first month of operation of 1RPP at "The Weir", working parties were supplied for various work in the Townsville area including assisting the contractor who was building their new Base Pool Camp. In December 1942, 1RPP personnel were glad to move to this newly constructed RAAF Base Pool Camp from their tented camp at "The Weir" after some heavy rain. They spent the next few months finishing off the construction of their new camp. A new Chapel was dedicated at the Base Pool Camp on 26 August 1944. During April 1943 Air Training Corps personnel attended a camp at the site and were trained in service routine and defence training. In June 1943 a large vegetable garden was planned by No. 1 Reserve Personnel Pool to supply fresh vegetables to other units in the North Eastern Area. 10 boxing tournaments, four unit dances, four concerts, a visit by the mobile broadcasting show and four visits by the RAAF Mobile Cinema were held at the camp during August 1944. A new picture theatre with a seating capacity for 1,200 personnel was opened on 29 October 1944. No. 10 Transportation and Movements Office was attached to No. 1 Reserve Personnel Pool at Aitkenvale at some stage during the war. The footprint of the former RAAF Base Pool Camp Aitkenvale is bounded by Wakeford Street at western boundary and Meadowbrook Drive and Grant Avenue on the eastern boundary and Burt Street on the northern boundary and Ross River on the southern boundary.